On 30 December, 2015, Centre for Research and Information (CRI) organized a Let’s Ta!k with the British Parliamentarian Tulip Siddiq. 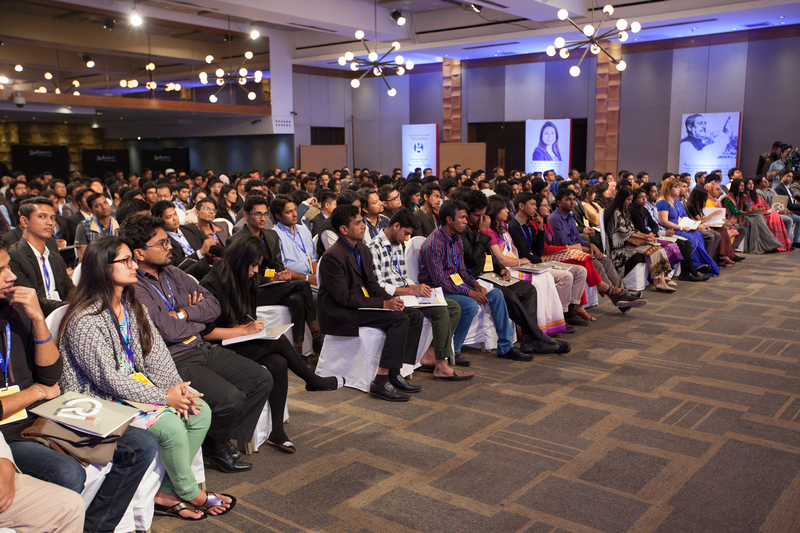 Around 350 participants took part in this interactive discussion at Utshob Hall of Radisson Blu Water Garden Hotel, Dhaka. The topic of this session of Let’s Ta!k was “Road to Westminster”. The participants consisted of youths from a cross section of society, including among others, students of public and private universities, young professionals, entrepreneurs, development workers etc. The topic of the event was “Road to Westminster”. The main theme was highlighting to the young participants the life story of Tulip, her struggles and triumphs, likes and dislikes, and thoughts generally on politics, society and people. For the ease of discussion, the event was divided into three segments: Tulip the Person; Tulip the Politician; and Tulip’s Future Vision. Participants took part in the discussion according to the themes. When in Bangladesh, Tulip likes to cook together with her family; playing badminton with friends and family; playing with the children of her elder brother Radwan Siddiq. She commented that whatever it might seem from outside, their family is just like any other family of Bangladesh as regards what they do when they are together. In her free time, Tulip likes to swim. This is a good exercise given her irregular timings of work. She also keeps fit by doing yoga and Pilates. Since being elected to Parliament, she does not have time to do much else. But she loves drama. She acted in, and directed, Shakespeare’s timeless drama Midsummer Nights Dream while in school in Dhaka. She also starred in a Bangladeshi TV drama years back, titled “Boishaki Jhor”. She also acted in, and directed, plays in college. For instance, there was one called “Women Alone”, which was based on raising awareness on women’s issues such as forced marriage, domestic violence etc. She said she would want to do drama again if I she got the time and opportunity. Tulip stated unequivocally that despite the advances made by UK, even they cannot boast of a society where motherhood is supported as much as possible. She stated women politicians are in a particularly stressful position, as the timing of Parliament is quite irregular and often leads to very late night closings. Even in UK, Parliament has no formal maternity leave. So, she is working to change and improve that. System has to be changed for women to participate more in politics. Her husband and parents gave her lots of support. In that regard, she is lucky as many families may not so caring. Tulip commented that the love of the people in Bangladesh makes her want to stay in this country. She said that many have commented since she came to Dhaka this time that she is the pride of the nation. But she thinks it is the brave freedom fighters, who gave their lives for the country’s liberation, are the real pride of the nation. She noted with pain, the genocide and havoc reeked on Bangladesh in 1971. She says that it is amazing what Bangladesh has achieved within forty years of such a bloody and devastating start. Bangladesh is still a young country, and needs more time to develop further. However, given the optimism surrounding the country’s economy from organizations like Goldman Sachs and JP Morgan, it is apparent Bangladesh is all set to become a developed country in the future. However, she stressed the role of education in this regard. This sector needs to be focused on more for further advancement of the country. She said that there are reasons for optimism in Bangladeshi politics. Whatever your religion, you are firstly Bangali. We are proud of that fact. People are very politically conscious. Even 4/5 year olds in Bangladesh can tell the names of the Prime Minister and the leader of the Opposition. Voter turnout is also very high in Bangladesh elections. In a country where there is such interest in politics, there is always scope to get engaged and further improve. Tulip wants to see Bangladesh or UK win the next cricket world cup. She also wants to see the Bangladeshi women cricket team to do more better. She said she would teach Bangla to her children. Tulip’s mother always reminded her and her siblings of the importance of knowing one’s own language. Her husband is learning Bangla too and receives regular lessons. She said people all over the world want to more about the Bangali language and culture. We have a rich heritage and culture, she added. Tulip noted that her mother (Sheikh Rehana) and aunt (HPM Sheikh Hasina) have always taught her that one can do whatever one wants. Confidence is the key in this regard. She said she learnt about her paternal grandfather and grandmother from books and other persons. She was quite close to her maternal grandfather and grandmother. It was a joint family. She says that this feature is missing in London life. Staying together, with children playing games like hide and seek. Her mother, Sheikh Rehana, did not want Tulip to go into politics. Which was understandable as she lost almost everyone close to her to politics on 15th August 1975. She wanted her to do something else, such as being a lawyer. She agreed once she heard that Tulip would join politics in UK, although Tulip humorously recalls that she was visibly irritated at the prospects of campaigning for her daughter, having done that numerous times before for her father, and then her sister (HPM Sheikh Hasina). Nonetheless, Tulip did not forget to mention that indeed, her mother helped her immensely during her campaign by feeding all the volunteers and doing fundraising. Sheikh Rehana still sends her food every day in Tulip’s house, even after she got married. In her campaigns, her other family members also contributed. Her sister Ruponti and brother Bobby had both personally campaigned for Tulip during polls time. Both of them have also been sources of inspiration, generally for Tulip. Although she did not see her maternal grandfather, she heard and read about him a lot. She learnt firsthand many things from her aunt, HPM Sheikh Hasina. From them, she learnt that values and ideology are important. Without them, policies etc are nothing. Her mother and aunt had always told her that they are here to protect the people of Bangladesh. That’s what they have always said to her: Serve the people. Tulip believes that such serving can take place anytime and anywhere. She added that her aunt and mother have always advised her to listen to others no matter how high she climbs in her ladder of success. She was reminded never to be arrogant and be ready to learn from others at all times. Pride is detrimental they said. Humility should be the basis. Tulip stayed in Bangladesh for four years, when she studied at the reputed Scholastica School in Dhaka. From her childhood, she recalls fondly her memory of meeting Mother Teresa in Dhaka. She remembers having given flowers to her. She described it as a memorable incident of her life. She also mentioned meeting Nelson Mandela too. She particularly mentioned her early life spent in London, Dhaka, Singapore and Brunei. She mentioned that she is living in her constituency of Hampstead and Kilburn from the age of 15. That is why becoming MP in that very constituency makes her election win that much special for her. She remembers that her mother moved to London, UK as a political asylum, fearing for her life in the aftermath of the infamous assassination of Bangabandhu Sheikh Mujibur Rahman and almost his entire family on the 15th August of 1975. 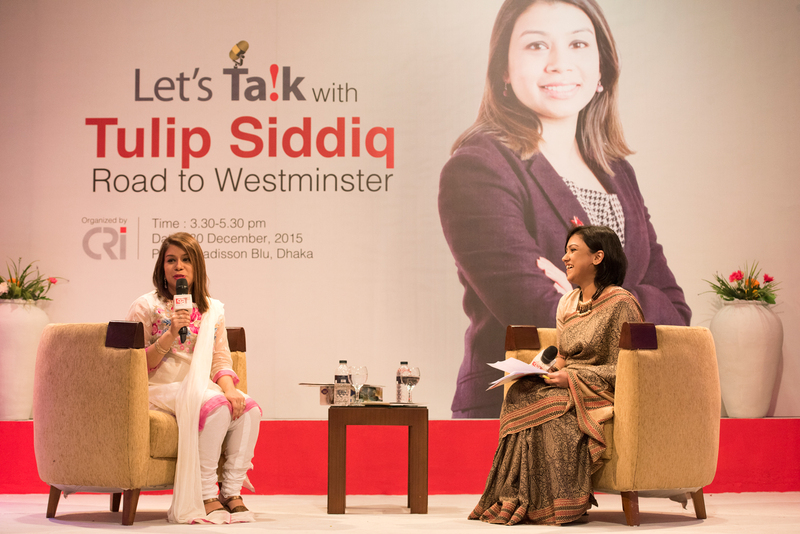 Politics was a very natural course of advancement for Tulip Siddiq as she grew up in a family, like many other families in Bangladesh, who are very conscious politically. It was a subject that was discussed in her home on an everyday basis. But she admitted that early in her childhood, becoming an MP would have been the last thing on her mind. Then, she wanted to become an English teacher. When Tulip was 10 years old, her father fell terribly ill. They were told that he could never walk or talk again. Her father received treatment from UK’s NHS, and later not only walked and talked, but became a university professor. This free healthcare service, NHS, initiated and always patronized by Labour Party, attracted Tulip towards this party, as opposed to the Conservatives. When the time came at 15 years age to make a choice when entering politics, Tulip opted for Labour. She prefers their emphasis on public service, social justice and equality. She mentioned her electoral defeat in Camden Council elections in 2006 (the same seat she won in 2010) to make the point that win and/or defeat is always there in politics. She enjoyed the electoral process even though she lost. She particularly remembers fondly knocking on doors, speaking to people, campaigning etc. She campaigned for Obama in 2008, which she enjoyed as well. Since 2010, handling the decision-making in a big budget oriented council enabled her to learn about the political processes more closely. When the longstanding MP of her constituency Glenda Jackson retired, she started work on getting the nomination for election to the vacant position. The nomination process was very hard. Glenda Jackson was very popular. It was difficult to follow suit in such a person’s footstep, especially given Tulip’s age, which was quite young for an MP. In order to win the nomination, and later the election, Tulip had to work very hard. She had to do lots of local campaigns, including for post offices and fire stations. She organized protests, wrote papers, and arranged rallies etc. for the issues. She also wrote regularly in her local newspaper. It was a long process for the people to know her personally. At the Council she worked hard in support of library, sports center, etc. from government plans to cut. She devised her own plan to raise funds, arrange volunteers, as a result of which efforts the libraries, and sports centers all remained open. People realized that she understands policies and works for local needs. Whenever she gets the chance she tries to help people, such as with housing for people of that locality, places in schools, writing on behalf of constituents and so on. She sits for two hours in various locations of her constituency, every day to meet, help and counsel at least 50-60 people. They seek advise or help in various issues such their children, schools, housing, criminal issues, domestic violence, custody issues, and writing on their behalf to government departments. She highlighted the need for youths to be interested in, and join, the political processes. She also noted that the importance of good youth wings for political parties. She gave the example of how good communications exists between Young Labour and senior members of Labour Party. She says this emphasis on linkage between the streams within a party can be explored further in Bangladesh to improve the overall quality of politics. Her aunt, HPM Sheikh Hasina has taught her that the most important thing in politics is patience. One must have patience for politics. In MP Surgery, she has to talk to several people everyday and sometimes handle difficult constituents, who make unrealistic or unreasonable demands. She has to handle these with patience. On campaigns, she said that she prefers door-to-door interactions. She explained how she and her volunteers worked in small teams of 5-6 people. On good days, 10 teams would visit houses, otherwise less. Conversation with people personally on issues, which they consider important, is one of the important campaign strategies. Apart from five paid employees, her campaign was supported by thousands of volunteers. She also did a lot of fundraising campaigns for herself. She noted that endorsement influences voters. For instance, a famous comedian tweeted his endorsement, which drew support from the youths; or a selfie with a famous person appearing in a newspaper can influence votes among youths. She said that it’s not true that young people are not interested in politics at all. She said this is proved by the high turnout at the event in which they were in at that moment. She said young people are passionate about issues, but not always in party politics though. Joining Conservatives or Labour might not interest them. But they are interested to work for causes. If we can explain politics relevant to people’s every day lives, they will join more political parties. Upon being asked what is her next target in politics, Tulip said that she has a lot of work to do as a MP for her constituency in the coming years. She said she won the election in the marginal area by 1,100 votes. Next time, she aims to win with a bigger margin due to her work. She also wants to be a good mother. While maintaining her career, she wants to look after her family and give time to her children. Tulip clarified her strong support for feminism. She said she is not ashamed of making the world equal for women and men. To her, the definition of feminism is simple: giving her daughter the same opportunities as her son. She noted that this issue is not only important for Bangladesh, but for Britain too. She asked why there are so few female High Court judges and company directors in the UK. She appreciated the progress Bangladesh has made in this regard by noting that here, the Prime Minister, the Leader of the Opposition and Speaker of Parliament are all women. She also responded that she finds no conflict between her religious beliefs as a Muslim woman and her support for feminism. She explained that people who are misogynistic to begin with misinterpret religion. She said that if one reads the Holy Quran, one would find the position that is offered to women in Islam. She complained that self-appointed community leaders who misinterpret religious for their own gains often cause the misunderstandings. Upon being asked about her comments on having different streams of education within one country, Tulip said that the situation is same in UK where there are different types of schooling, such as fee paying schools, Islamic schools, Jewish schools, private boarding schools etc. It is a fractured process, which produces students with different standards of education. She suggested that both Bangladesh and UK must focus on following a minimum national curriculum. This would ensure that everyone has a uniform basic understating of core subjects like mathematics for example. She also highlighted the importance of having properly trained teachers for ensuring quality education. She commented that a good teacher could have an impact on someone for the rest of his or her lives. For youths, she particularly emphasized that education is very important. She advised them to find their passion and follow their dreams. She said they should think carefully about what they want to do and study attentively. There is no alternative to education for development. On discrimination, Tulip said that there are only 40 MPs from 650 in UK who are from ethnic minority backgrounds. When she was contesting elections, many advised her to use her married name as opposed to her Muslim name, Tulip Siddiq, as people may not vote for a Muslim candidate. However, she refused to change her name, saying she won’t take such measures to become an MP. She did not, and still won the election. She mentioned that London could soon have a Muslim mayor, Sadik Khan, the Labour nominee. On Islamophobia, Tulip said sensationalist coverage of terrorism in the media fuels bigotry against Muslims. ISIS, wars etc. become the face of Islam in the eyes of people rather than ordinary peace loving Muslims around the world. On British Bangali women joining ISIS, she said that this is a consequence of a mix of factors, including, identity crises and a lack of integration. Terrorists, who groom them online for instance, then capitalize this state of despair. She said that she would work more on this issue in coming days. She said that she met with the parents of the girls who went to Syria to join ISIS from East London. They looked very sad for the radicalization of their daughters. Defending her position on demanding a ban on Donald Trump, Tulip commented that a person, who cannot differentiate between Muslims and terrorists, does not deserve to the President of the most powerful country in the world. She demanded the ban on the basis that he was preaching hate against an entire community of 1.6 billion people. He could not have been naïve as to the impact of his words. Upon being asked by a participant to describe herself in three words, Tulip said that these would be: Determined; Principled; and a Feminist. Her determination was demonstrated when she won Labour nomination for Hampstead and Kilburn, one of the most marginal constituencies in London. She recalls that some said that she could not do it. But she did, because of her determination. Her focus on principles was demonstrated when she voted against a bill on welfare in the House of Commons because it went against her strong stance on social justice. She is a feminist because she is passionate about women’s issues and has always been vocal about it. Responding to a question, Tulip said that the happiest days of her life was the day when she got married and on the day she won the MP election. She mentioned that the day on which her paternal grandfather died, was one of the saddest days of her lives as she was extremely close to him. She also remembers the grief on the day London transport systems got bombed by terrorists (the 7/11 terror attacks). She added that use of religion for causing violence and mayhem always makes her sad. A participant asked which legacy she values more, being the granddaughter of the Father of the Nation, Bangabandhu Sheikh Mujibur Rahman, or being a British-Bangladeshi girl who rose the ladders of politics from the bottom and became a British MP. She answered that she is proud of both these identities. While being the granddaughter of Bangabandhu is in itself an inescapable legacy in Bangladesh, she also values equally her struggles, trials and tribulations in the arena of politics. Tulip thinks that young ladies should do something they’re passionate about; something they love. They should not do something merely because someone told them about it or they ought to do it. She said: “whatever you do, enjoy it”. She said she works in the area in which she is passionate about. There would be expectations on them. But the primary consideration should be one’s choice, she advised. Upon being enquired as to her thoughts on bringing back Chowdhury Mueenuddin, the convicted war criminal currently absconding in UK, Tulip replied that this is a legal issue of UK, on which she could not comment, as there are governmental and judicial processes involved. However, she pointed out that the trials in Bangladesh show overwhelming support from the people, as shown by nearly all opinion polls conducted on the subject in recent times. In transitional justice scenarios, such trials are very important for the countries to recover and rehabilitate from the painful past. This is part of moving on and healing process, she said. Its Really Royal working platform for Bangladesh. Want to provide total effort for my country.